... and it looks like mighty good eats in the background! Of the food, John wrote, "Linn really put this shindig together and began cooking at 4:00 AM. 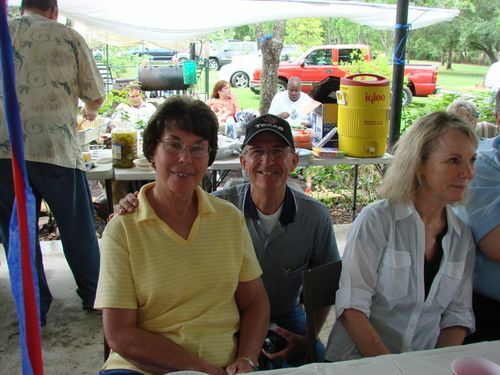 She cooked 60 lbs of brisket, Matt made tubs of potato salad, cooked margarita chicken (45 chicken quarters), Susan made baked beans, Dolly made banana pudding - YUM,YUM - and several others also brought dishes. I don't want to leave anyone out, so if y'all brought something, please let me know."